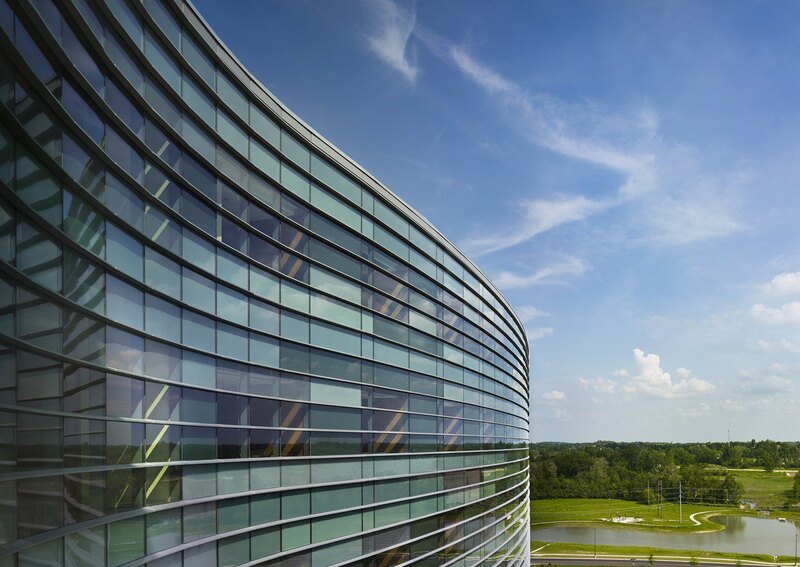 Located on a 162-acre landscaped campus in rural Kentucky, Owensboro Health Regional Hospital transforms healthcare delivery for the 11-county area through a flexible design that accommodates streamlined processes, advanced technology, and future growth. Our in-house process engineers conducted a series of workshops with community members to gather patient stories and identify “Keystone Experiences”—experiences starting from the parking lot and continuing to the main lobby, waiting rooms, patient rooms and finally check-out—that contribute to the patient experience, sense of comfort, and quality of care. Concurrent with the patient experience workshops, the team applied Lean principles that enabled the hospital to achieve an operationally efficient plan. They mapped current work processes using photo journaling, future-state operating models, site visit research, technology assessment, and current-state process mapping. From this data, the team identified gaps in the workflows to propose future operational models that promote on-going healthcare improvements. Additionally, Integrated Project Delivery (IPD) maximized efficiencies during construction, enabling the team to implement prefabricated building systems, innovative scheduling processes, full system coordination through Building Information Modeling, and a “paper light” project that utilized on-line documentation platforms. Overall, IPD reduced project cost, allowing Owensboro to reinvest into patient-focused amenities without increasing budget. The nearby Ohio River inspired the site design, undulating architectural forms, and creation of healing environments throughout the patient floors. The river concept connects the shared public spaces and continues through curvilinear forms within the building, re-emerging at the north garden as a seven-acre healing pond. The rough-cut stone base reflects regional materials while the overall nature-tone color palette supports a therapeutic effect of a healing environment. Inside, shared material palettes unify waiting areas in the Diagnostic and Treatment building and Bed Tower. Internal courtyards bring light into the building and provide views that create calming distractions for patients, visitors, and staff. Etched-glass screens divide waiting areas from public circulation, offering patients privacy. Comfortable lounge seating, grouped around a variety of design features—a stone hearth housing a TV, niches featuring local artists, and access to exterior windows—provide a positive distraction and choice in a setting. Similar design elements in each waiting promote a positive patient experience. Medical spaces promote operational efficiencies. Medical equipment is out of sight but within easy reach of the 400-SF rooms, one-third larger than the previous hospital. Decentralized nurses’ stations are tucked outside each patient room, positioning nurses’ closer to patients. All medicines and supplies are in the room or are less than 20 steps from the bedside, allowing caregivers streamlined access to patients. By conducting predesign Lean studies, intensive workflow analyses, MEP system testing, Owensboro Health Regional Hospital reduces operational expense, changes the healthcare delivery model, and optimizes the patient care experience. 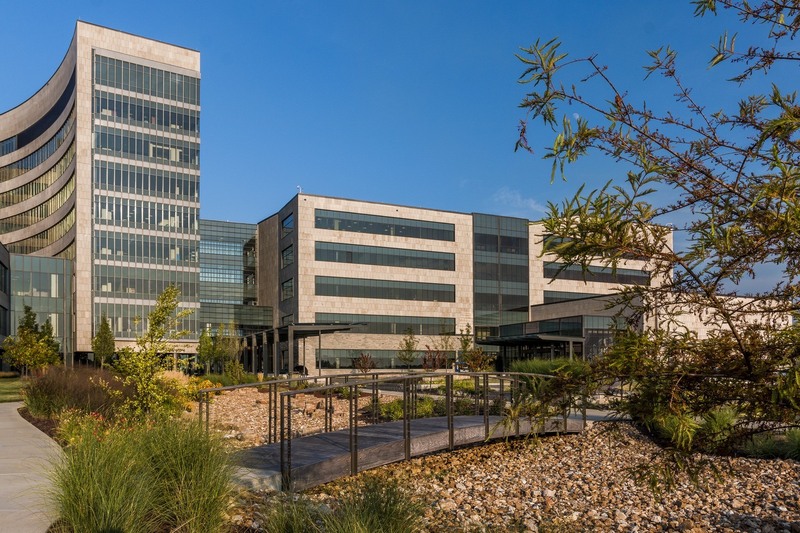 The LEED® hospital include a series of courtyards that provide daylight to interior spaces, green roofs, a heat-recovery chiller, locally harvested materials, native grasses and flowers, storm-water management, and restoration of an adjacent flood plain. Owensboro is the first hospital in the world to be designated a Certified Signature Sanctuary through the Audubon International Signature Program. The certification recognizes successful integration of wildlife conservation and habitat enhancement, water quality monitoring and management, integrated pest management, water conservation, energy efficiency, and waste management. Each floor is designed for premium efficiency. Patient services are closely connected to reduce transport times in life-threatening situations, such as stroke or heart attack care, when minutes can make the difference in patient outcomes, or even life and death. From day one, Owensboro Health was committed to creating a 21st-century facility that would revolutionize the way healthcare was provided to the community and this commitment carried throughout the project. As a team, we were able to achieve extraordinary results through close collaboration and innovation. Turner is proud to have been a team member in building a facility that will positively impact the community for many years to come.